A classic favorite for adding abundant color to hard-to-plant shady areas. 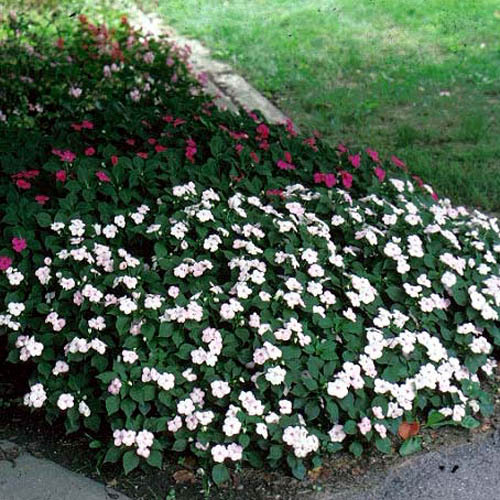 Impatiens seldom fail to please with its mounding growth habit and colorful flowers in shades of pink, white, red, purple, and orange. Does not perform well in sunny locations where it needs too much water. indoors as a houseplant - Grow indoors in bright light using rich, well drained soil that is kept moist but not soggy. Flowers come in many variations of red, orange, purple, white, and pink. 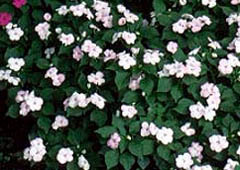 Some varieties Impatiens bicolor flowers in pink, red, orange, purple, and white. Some have bronze tinted foliage. Stems break easily, so handling should be kept at a minimum. Some varieties have a wide, sprawling growth habit, while others tend to grow more upright and dense. Propagate by seed, cuttings - Sow seeds indoors 12 weeks before the last spring frost. Do not cover the seeds with soil, as they need light to germinate. Until the seeds germinate, cover the seed trays with clear plastic to maintain high humidity. Water from below to prevent damping off. If large stock plants are available, cuttings can be taken in the spring. They root easily in potting mix. Pre-started plants are readily available at retail outlets. Pinch back the plants to keep them bushy. Keep medium moist but not soggy. Avoid sunny locations as plants will require too much water. Look for varying heights and plant shapes, single- and double-flowered types(doubles look like miniature roses), various single flower colors and combinations, dwarfs. 'Mini-Hawaiian' Series: miniatures in various flower colors. �African Queen�: the only yellow-flowered variety. Yellow flowers with red markings in their centers. 1- 1 �� tall in pots, to 2� tall in the garden.